As per the categories of the taxpayers depending on their source of income,the income tax department issues different Income Tax Return forms (ITR) every year. The compliance form is simple for those who earn income only from sources such as salary, one house property and other income. Such taxpayers are required to file their income tax return in ITR-1. However, if the income earned includes any capital gains in addition to the above specified incomes, the tax payers shall be required to file ITR-2, which is more detailed and needs more disclosures. The deadline to file the income tax return for the financial year 2017-18 is July 31, 2018. The cut-off date becomes more critical this year onwards as filing of the income tax return beyond this date would attract levy of maximum penalty of Rs 10,000. Every year, the employer asks its employees to furnish details of their investments which is taken into consideration for withholding income tax on the salary. Many-a-times, employees fail to furnish such details which results in excess deduction of tax from their salary. Withholding tax is only a part of the mechanism for the payment of income-tax to the government. Withholding of tax does not mean the final payment of tax due for the year. Total tax liability for the year may differ from the withholding tax. Thus, the tax payer should ascertain its total tax liability taking into consideration taxes withheld and make payment of the balance tax as self-assessment tax, if any, before filing its return of income. This would also attract interest liability if the tax payer has not made payment of the advance tax. Read Also: Income tax return: इनकम सोर्स के आधार पर होते हैं 7 तरह के ITR फॉर्म, जानें आपके लिए कौन-सा है सही? 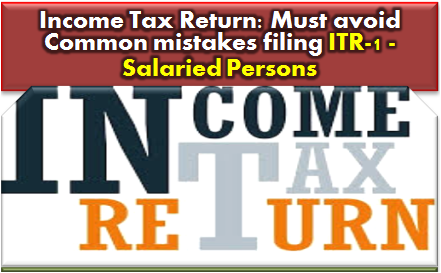 The ITR forms specify five categories of income under which all incomes can be declared while filing the return. One such category is “income from other sources”. It is a residual category which includes all types of incomes which cannot be classified in the four specific income categories (that is, salary income, business/professional income, capital gains and income from house property). Passive incomes like interest and dividend should be declared under this category in the ITR form. All the savings bank interest should be reported fairly in ITR as the income tax department requires disclosure of all incomes of the tax payer. Also, report taxability of fixed deposit interest income. A person may be liable to pay tax on the total income higher than the rate at which tax was withheld by the bank while making payment of the interest income on FD. The taxpayer should avoid common defaults or omissions. Personal details should be filled correctly; return should be verified; right ITR form should be used; capital gains should be reported to avoid any inquiry by the IT department, even if the taxpayer is not liable to tax owing to the fact that due investments have been made to save capital gain tax.